The study aimed to determine whether an origami intervention program added to the typical special education program would increase the levels of attention and impulse control of selected children with autism (CWA). 1. Is the origami instructional manual appropriate and valid based on the evaluation of selected experts? 2. What are the levels of inattention and impulsivity of the experimental group before the origami intervention program? 3. What are the levels of inattention and impulsivity of the control group before their typical special education program? 4. What are the levels of inattention and impulsivity of the experimental group after the origami intervention program? 5. What are the levels of inattention and impulsivity of the control group after their typical special education program? 6. Is there a significant difference between the pretest and the post-test scores of the experimental group? 7. Is there a significant difference between the pretest and the post-test scores of the control group? 8. Is there a significant difference between the post-test scores of the experimental and the control groups on the attention scale? 9. Is there a significant difference between the post-test scores of the experimental and the control groups on the impulse control scale? The research hypotheses for the study were restatement of problems 6, 7, 8, and 9. The four respondents in the control group maintained their typical special education program while the other four in the experimental group had an additional 20 sessions of origami intervention. The participants were chosen through purposive sampling to make each group comparable in age, functionality, auxiliary services received, and initial levels of attention and impulse control. A two-part observation scale validated by a special education expert and a statistician was used in both the pre- and post-tests of both groups. Results were analyzed by obtaining the means and statistically compared using the Mann Whitney U test. The six experts rated the origami manual highly satisfactory on all four categories of concepts, instructions, activities and appropriateness. Pre-test results indicate that both the experimental and control group displayed low levels of attention and impulse control. Based on the post-test results, both groups displayed higher levels of attention and impulse control. When the pre-tests and the post-tests of each group were compared, both groups had a significant increase in their levels of attention and impulse control. The experimental group, however, had a significantly higher increase in attention than the control group when both the post-tests were statistically analyzed and compared. Both groups levels of impulse control, on the other hand did not differ significantly. 1. The origami instructional manual is valid for CWA ages four to seven years old. 2. CWA improve in their levels of attention and impulse control when provided with typical special education program. 3. CWA demonstrate significantly higher levels of attention and when additional origami intervention is added to their typical special education program than those with just the plain, typical special education program. 4. There is a great potential for origami intervention among CWA in increasing their levels of attention than impulse control. 1. Additional studies using the same instructional manual can be done on other variables and on a longer time frame. 2. A replication of the origami intervention program focusing on different variables such as age, levels of attention, or children with and without disability can be done. 3. Schools in coordination with special education practitioners can use the developed origami intervention program to increase levels of attention among CWA. Using origami as an intervention strategy to address inattention can be included in the training of prospective special education teachers. 4. Studies on origami intervention with social interaction in a class setting can be implemented. 5. More studies can be done on other forms of intervention for CWA. Autism is a pervasive developmental delay which manifests symptoms in areas of language, social interaction, sensory integration, behavior and school work. Children with autism (CWA) have difficulty attending to and staying on at a task resulting in off task and impulsive behaviors. With diagnosis of autism increasing annually, behavior problems of inattention and impulsivity are increasing difficulties in the schooling of CWA. Many teachers realize that CWA need to control their impulses and lengthen their attention span in order for them to succeed in school. Providing more effective means to increase their levels of attention and impulse control is therefore, needed. Literature on autism states the need to address the behavior problems related to inattention and impulsivity. Experts stress that special education practitioners need to utilize more intervention strategies addressing inattention and impulsivity concerns among CWA. The development of attending and impulse control skills are foundations to success in schooling as CWA will have to learn to regulate their responses, attend to lessons despite distractions, and delay impulses (Marks, Shaw-Hegwer, Schrader, Longaker, Peters, Powers and Levine, 2003; Dizon, Baldo and Camara, 2000; Hallowell, 1994). This study used origami intervention to increase the levels of attention and impulse control of CWA. In regular schools, origami has been an enjoyable activity to better improve children’s success in primary schooling. Origami is a form of visual art using step-by-step instruction to fold paper sculptures that children can learn from and even play with. 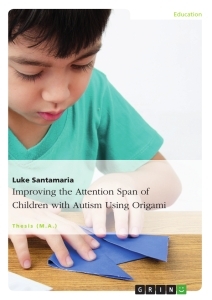 With the catchy and simplified instructions on origami, the study determines if the addition of an origami intervention program is an effective way to increase the levels of attention and impulse control among CWA. Since attention and impulse control form the basic pre-learning skills of preschool-aged children, it will be necessary for CWA to increase such learning prerequisites for success in school. This study aimed to determine whether an origami intervention program added to the typical special education program would lead to increased levels of attention and impulse control among CWA. 6. Is there a significant difference between the pre-test and the post-test scores of the experimental group? 7. Is there a significant difference between the pre-test and the post-test scores of the control group? The study is a significant contribution to these persons/sectors: CWA, teachers and therapists, parents and other home members, schools, and the business sector; and also to future researches on autism and origami. Through origami, the children will be able to create their own toys based on the paper sculptures they will make. They will review school concepts such as shapes, lines, colors, objects and animals. As they get involved in folding origami paper sculptures. Teachers will be able to use origami to train students with or without disability to increase levels of attention and impulse control while making the learning environment fun and invigorating. Upon learning origami and how to teach it, teachers and therapists can integrate origami training in behavior management programs, art therapy, and other school activities to address children with behavioral problems in inattention and impulsivity. Using origami, parents can hold the attention and regulate the impulses of their children in order to develop appropriate school behavior or put into practice the activities taught in school. Parents will be able to use new and enjoyable ways to manage their children’s behavior in rearing them for independence. The home can benefit from the study as siblings use origami to play with brothers or sisters with disabilities. The entire family can use origami as playtime activity to strengthen family ties. Other than the benefits to home and the school, the study can also be beneficial to businesses and the society. Origami centers for behavioral therapists and physical therapists can be established and schools can start origami programs and seminars to address the behavioral needs of children. Origami workshops can be developed to address a larger population who need intervention in inattention and impulsivity. Origami contests, exhibits and fairs can be established where students with disabilities can display their work and demonstrate their abilities. Bazaars and businesses can employ people with disabilities who can make paper sculptures that can be sold as giveaways, souvenirs, decorations, or even exported as authentic Filipino-made art products. The study contributes to philanthropic movements such as origami making for world peace or origami to promote cultural awareness. Continuing research in origami in the area of special education can involve other related fields such as occupational therapy, physical therapy, and art education. The research can initiate the use of origami to address behavioral, fine-motor and academic concepts. More importantly, research on origami as a form of intervention can be done to address other behavioral concerns or disabilities. Research can also be implemented to larger numbers of participants or in a class setting. The study adopts the quasi-experimental design. The study involves two groups each composed of four CWA. To form equal groups, the study used purposive sampling to match the participants’ ages, levels of functionality and ongoing auxiliary services received. The experimental group was exposed to the origami intervention added to the typical special education program while the control group went through the typical special education program of the school where all participants were enrolled. To provide quantitative data, both groups were observed for the pre-test and the post-test to determine their levels of inattention and impulsivity. The study used two researcher-developed instruments. These are the 2-part observation scale for attention and impulse control and the origami instructional manual. The observation scales list behavioral indicators each for attention and impulse control totaling to 20 items. The items were rated using a 5-point scale to identify how frequent each behavior was displayed by each participant. The researcher-developed origami instructional manual is composed of 20 lessons teaching four origami paper-sculptures beginning from one fold to four folds. The paper sculptures were taught using two sizes (15 cm by 15 cm and 30 cm by 30 cm) and two types of paper (Cartolina and Felt). Each session began with a review of the previous session, and then proceeded to teach the child origami through demonstration, guided practice and evaluation. A culminating fifth session served as a reinforcement and evaluation of the specific paper sculpture. This ensured the mastery of what was taught. The intervention and observations were done in the selected school. Hypothesis #1: There is a significant difference between the pre-test and the post-test scores of the experimental group. Hypothesis #2: There is a significant difference between the pre-test and the post-test scores of the control group. Hypothesis #3: There is a significant difference between the post-test scores of the experimental and the control groups on the attention scale. Hypothesis #4: There is a significant difference between the post-test scores of the experimental and control groups on the impulse control scale. This chapter contains a review of related literature and studies, the conceptual framework, and the definition of terms. Autism Spectrum Disorder (ASD) is a developmental disorder which is more commonly known as autism. This disorder affects the way the brain uses information. The disorder affects functionality on cognitive processing resulting in stereotypic behaviors. Autism usually affects the individual from birth. Autism brings with it delay or deficit in the development of children leading to cognitive and behavioral deficits. It is characterized by its three early indicators: the lack of eye contact, lack of attention to the same item or topic the other interacting person is focusing on, and the lack of reciprocal conversation or turn-taking. The mentioned behavioral deficits affect the functionality of CWA. As a result, the disorder affects a person’s functionality resulting to the child’s inability to function normally (Heward, 2006). The Diagnostic and Statistics Manual of Mental Disorders, commonly known as DSM-IV, states that people with autism may exhibit a range of behavioral symptoms. The general behavioral symptoms include short attention span, impulsivity, aggressiveness, self-injurious behaviors and temper tantrums (American Psychiatric Association, 2000). A spectrum disorder means that its symptoms range from mild to severe. This affects the level of functionality of the child. The different subtypes of autism have varieties and ranges of symptoms and functioning. The four commonly known subtypes of autism are Asperger syndrome, Rett’s syndrome, childhood disintegrative disorder, and pervasive developmental disorder—not otherwise specified (PDD-NOS). People with Asperger syndrome have normal general language development and average to above-average intelligence. However, they display odd behaviors and may have a different way of socially interacting with others. Children with Rett’s syndrome have a slow growth of the head. People with Rett’s syndrome usually have stereotypic movement of the hands. People with this disorder also exhibit impairments in language and cognitive abilities. Childhood disintegrative disorder is similar to ‘classic autism’. However, the symptoms of autism only begin to show after two to ten years of age. People are diagnosed with this disorder at a later age when the autistic symptoms begin to manifest in behavior and functioning. People with pervasive developmental disorder—not otherwise specified display various symptoms of autistic spectrum disorder but do not exhibit all of the given criteria. There are many more subtypes of autism, hence its classification as a spectrum disorder. People with autism can move within the spectrum from low-functioning to high-functioning stages (Wall, 2004). Generally, people with the subtypes of autism can exhibit a few or all of the autistic symptoms. The most common deficits are in the areas of language and cognition. The deficits in both areas affect social interaction and behavior. People with autism are restricted, repetitive and stereotypical in their interests and activities. Until today, the cause of autism is still unknown. Researchers suggest that there is a problem that affects the parts of the brain which process language and information from the senses. This inability in cognitive processing leads to developmental delays and deficits in social interaction and learning. Various researches suggest that the cause of the disorder is the imbalance of certain chemical in the brain. Other researches point to genetic factors. Many experts agree that autism may be a result of a combination of several causes. These several causes affect many areas in an individual’s living which leads to delay, deficit and excesses. The cognitive processing is thus affected which results to the evidence of the disorder through symptomatic behaviors (Wall, 2004). Numerous experts have determined that the behavioral symptoms of autism are caused by abnormalities in the brain that affect early cognitive development in children. CWA are unable to meet certain developmental milestones because of their inability to learn normally. Being able to regulate impulses and sustain attention are some milestones that increase with age. Since CWA are unable to develop these pre-learning behaviors, the problem has caused concern among their parents (Thiers, 2007). Experts in the area of education have noted that CWA exhibit difficulties in school. Most of these deficits are displayed in the areas of communication, school work, social interaction, judgment, reasoning and interpretation. Two educational prerequisites are attending to tasks and managing one’s impulses. In school work, children are required to have these skills, however, with the behavioral symptoms of autism CWA are unable to move on to learning higher order skills such as following directions, sequencing objects and events. The special education team consisting of parents, teachers and support staff provide intervention on inattention and impulsivity in order for CWA to move on to higher academic skills development in school. CWA can be distracted during class or individual work and are usually unable to attend to specific lessons and adapt to shifts in activities or class transitions. If their levels of attention and impulse control increase, then they will be ready to learn to read, spell and write. The importance of addressing these initial skills leads to their development (Marks, Shaw-Hegwer, Schrader, Longaker, Peters, Powers and Levine, 2003). Landry and Bryson (2004) stress the importance of addressing the learning needs of CWA by looking at the symptoms. Symptoms such as sudden disengagement from tasks and inattention can lead to difficulty in schooling. The bases for educating students with autism should take the symptoms of the disorder under consideration. Wall (2004) writes a historical account on autism highlighting the behavioral symptoms of autism as noted by Jean Mark Gaspard Itard. In 1799, a 12 year old boy was discovered in some woodland near Aveyo, France. Consequently, the boy who lived in the wild was captured and taken to Itard in Paris, France. The boy was then named “Victor”. Itard methodically recorded Victor’s behaviors which were the classic features of autism. Through Itard’s interventions, Victor’s social behavior progressed considerably. Though Victor did not speak; he learned to communicate in an alternative, non-verbal manner. Despite his deficits, Victor behaved more appropriately in social situations. Leo Kanner named and described the features of autism in 1943. Kanner identified commonalities among eleven CWA. Though the children looked normal, were expressive and had good motor coordination, they exhibited behavioral problems. The common behaviors were aloofness, lack of eye contact, lack of appropriate emotional responses, lack of visual and auditory responses, and lack of communicative speech. The children necessitated stereotypic behaviors, sameness, and the preference for objects rather than people and language. These eleven children were diagnosed to have Kanner Syndrome (Dizon, Baldo and Camara, 2000). In 1944, Hans Asperger identified children who tend to speak fluently by five years of age but are slow and off in their behaviors. Though these children functioned almost normally, they had a distinct manner of communication and add or awkward movements. These children were then diagnosed with the Asperger syndrome (Scheuerman and Webber, 2002). Diagnosis of autism has increased tenfold in the United States alone. In the 1980s the incidence was approximately 0.04%. Autism was diagnosed in four or five children out of 10,000 people. In the 1990s the incidence rose to approximately 0.30%. Autism was diagnosed in 30 to 60 children out of ten thousand. Currently, the incidence rate is approximately 55 to 57 children in a group of ten thousand. The causes for the increase in diagnosis are rooted to awareness and changes in diagnostic criteria (Szpir, 2006). In the United States, the incidence of autism has increased from 10% to 17% per year. Current research indicates that autism can be diagnosed as early as 18 months. 0.7% of the United States population currently has autism. Male children have approximately 52% possibility in having autism than female children. Parents of CWA have a 2 to 8% chance of having a second child with autism. In the case of identical twins, if one has autism, the other may be affected with 75% possibility. With fraternal twins, if one has autism, the other may have autism with 3% possibility. With the growing incidence of autism, there is a need to provide different interventions to address the learning needs of these children in order to help them as they grow up (AutismPinoy.com, 2007; WrongDiagnosis.com. 2007). Autism is the fastest growing developmental disability. In 1997, the Center for Disease Control and Prevention estimated that one in every 500 had autism. In 2002, BBC News cited that there were 3000 new cases in the United States. In the United States, statistics show that one out of 500 people, approximately 544,000 have autism. As of 2007, approximately one in 150 children has autism which is four to five times more prevalent in males than in females. In the Philippines, approximately 67 children are diagnosed per day with a new diagnosis almost every twenty minutes. Autism occurs in all countries, sexes and socio-economic classes (WrongDiagnosis.com, 2007; Marks, Shaw-Hegwer, Schrader, Longaker, Peters, Powers and Levine, 2003). The growing prevalence of autism among children brings with it the growing need to address their behavioral development. This portion discusses the latest studies done internationally that survey and address behavioral needs among CWA. Hyperactivity and inattention have been increasingly reported to be present among children with classical autism and Asperger syndrome. A recent study aimed to determine if the two behavioral symptoms are also present among children with PDD-NOS. Symptoms of Attention-Deficit/Hyperactivity Disorder (ADHD) which are impulsivity, inattention and hyperactivity were identified in children who were diagnosed with PDD-NOS. The study involved children age 3 to 12 years old. The researchers observed the respondents to assess the ADHD behaviors exhibited. The items of the instrument were based from DSM-IV which characterized the subtypes of inattention, hyperactivity and impulsivity. The study identified that the participants with PDD-NOS have actual ADHD symptoms (Gadow, DeVincent and Pomeroy, 2006). In their study, Konstantareas and Stewart (2006) exposed two groups of children to mild frustrating situations to determine their self-regulation. The study was based from the New York Longitudinal Study in 1997 where intensity of reaction, threshold of responsiveness, distractibility, attention span and persistence were some of the dimensions identified in the temperament of children. Based on these dimensions, the 2006 study identified specific needs of CWA. These needs were attentional focusing, attentional shifting impulsivity, and inhibitory control in the mentioned instrument. The researchers were able to determine how CWA coped with frustration compared to children without autism. The Children’s Behavior Questionnaire was used to determine behavior areas used to cope with frustration. The study found out that CWA used less effective affect regulation strategies. Attention focusing, inhibitory control and sooth-ability are the behaviors CWA lack in order to cope with frustration. Martin, Wolters and Smith’s (2006) study compare CWA from children without autism. The behavioral areas on impulsivity and attention were determined using the Childhood Autism Rating Scale. The study identified that CWA had greater impulsivity, lower inhibitory control and lack of focusing. Researchers compared children with Asperger syndrome from children with pervasive developmental disorder (PDD). The study was based on a previous research that identified inattention as a common deficit among CWA. Researchers evaluated the children with Asperger syndrome using a computerized test on attention and impulsivity. The results indicated that there were significant attention differences between the two groups (Shatz, Weimer and Trauner, 2002). In the University of the Philippines, two studies on behavioral intervention programs done by researchers in the Special Education Area of the College of Education focus on CWA. One study focuses on the behavior management of CWA while the other study investigates the components of intervention programs for CWA. Orande (2002) described the behavior management approaches in correcting inappropriate behaviors of CWA. The researcher used a 3-part questionnaire which was answered by teachers in seven public school and three private schools. Antecedent behavioral conditions, behavior management approaches, and targeted positive terminal behaviors are the three components in the study. With the three components towards behavior management clearly identified, practitioners can use these components to identify, create and implement effective learning activities. Establishing the goal in the beginning phase of addressing behavior problems among CWA is the best way to correct inappropriate behaviors. The study by Entienza (1996) explored the eight components of intervention programs for CWA. Through a survey he was able to identify the eight components necessary in intervention programs. These were referral, assessment, intervention plan, staffing, approaches, equipment, family involvement and support services. The results of the study suggested the creation of more interventions to complement educational and therapeutic programs. Currently there are very few studies for the development of intervention programs for CWA in the special school setting. Most of the local studies on behavior management focus on intervention of children with mental retardation or Attention Deficit/Hyperactivity Disorder (ADHD). There are a few studies involving the behavior management of people with autism. In 2002, Joaquin studied adolescents with autism to determine the concerns and problems perceived by their parents regarding intervention. The respondents of the study were 30 parents of adolescents with autism whose ages range from 12 to 18 years old. The study used a researcher-designed questionnaire to gather data on six priority areas of concern which were functional communication, interpersonal behavior, interdependent functioning, leisure skills, vocational behavior and vocational skills. The findings indicated that majority of the adolescents with autism were enrolled in special education programs and received more occupational therapy than speech therapy. The parents’ concerns towards their adolescents were functional communication, socialization, speech and conversational language. In 2006, Carlos studied the behavior management of atypical sexual behaviors of adolescents with autism. The study aimed to identify and evaluate the atypical sexual expression of adolescents with autism. Twenty special education teachers were interviewed to identify the changes their adolescent students with autism underwent during puberty and to identify the atypical sexual behaviors which manifest and how they are managed. The results indicate that there are some inappropriate behaviors present. Various management strategies that best fit the individual were developed to extinguish atypical sexual behaviors. A study on school programs by Primero (2005) described the individual practices in regular and special preschool programs for CWA. The study involved four special education preschools and seven regular preschools in Quezon City. The study gathered data from 15 regular teachers and 15 special education teachers who described the implementation of their respective school’s program for CWA. The results indicated that even regular preschool utilize individualized practices in assessment, curriculum, teaching methods among others. Still, special preschool programs are highly individualized in implementation. There are still significant differences in individualization between the two types of schools. However, there are no significant differences in the teaching method and instructional materials of both types of schools. There is a need to identify certain activities that can help develop positive behaviors among CWA. This is especially needed in the school setting where attending skills and impulse control are prerequisite learning skills. This portion of the review of related studies and literature discusses inattention based on its definition, specific behaviors, and implications in the school setting. Related studies were also reviewed and considered as theoretical bases for the development of this research. Inattention is defined as the inability to concentrate or attain perceptive awareness. While attention is the focus on a stimulus while ignoring environmental stimuli, inattention is the complete opposite of this. Psychologists use the term ‘lacking attention span’ to refer to the state of inattention (Kagan and Gal, 1998). Inattention affects the processing of stimulus usually leading to the inability to filter out distraction. Distraction can be internal or external. The effects of inattention lead to lower information processing. A child who is unable to keep task instructions in mind and to sustain attention in task changes becomes inattentive. To those who cannot manage attention, there is a need to teach them how to effectively use attention. Children can be taught on how to decrease inattention in order to improve their task performance (Johnson and Proctor, 2006). Inattention critically affects the cognitive processes. Planning, directing activities, initiating tasks, following through, utilizing working memory, sustaining attention, monitoring performance, inhibiting impulses and persisting towards a goal are all reliant on one’s capacity to attend. These neuropsychological processes are executive skills that inattention severely affects. Self-regulation of behavior is a sign of good executive skills which comes from the active participation of the child following a successful intervention. Participation in intervention enhances attending skills such as planning, metacognition, and self-regulation. Sustaining attention and goal-directed persistence are part of attending skills. Sustaining attention is the capacity to attend to a situation or task in spire of distractions, fatigue or boredom. Goal-directed persistence or finishing tasks is an example of attending behavior. Attention increases the person’s capacity to follow through to the completion of a goal, without being distracted (Dawson and Guare, 2004). While effective use of attention is done by selecting the object, person or concept of focus, while avoiding distractions, inattention is disengagement leading to the lack of concentration on the task. Attention and behavior are directly related. To decrease inattention, children must practice their attending skills because both attention and inattention are shown through behavior. Research claims that CWA have deficits in attention. The behaviors of CWA become smoother, faster, and more efficient when their attending skills increase (Ruff and Rothbart, 1996). The teacher must utilize creative strategies to increase interest and maximize the attending of CWA. Experts agree that behavior problems concerning attention may affect productive learning, causing CWA to be punished and intolerable in the community or during general education activities. Because inattention among CWA leads to behavior problems and is often viewed as a form of defiance, the children who lack these pre-academic skills have difficulties at home and in school (Marks, Shaw-Hegwer, Schrader, Longaker, Peters, Powers and Levine, 2003; Pearson, Loveland and Santos, 2007). Creamer (2005) stresses the importance of the special education sector to develop the attention of CWA. A beneficial program that helps CWA control their attention and consequential behavior is the ongoing provision of special education programs. Inattention interferes with the child’s classroom functioning because of the tendency of CWA to focus on inappropriate stimuli. CWA can be easily distracted making their behavior difficult to manage. Attending behaviors are observable and measurable when applied in the academic setting. When attending behaviors increase, the child benefits from the ability to attend consistently at longer periods of time, their reading comprehension and math skills improve. Irregularities among CWA are often displayed as behaviors which affect the children’s schooling. Difficulties in disengaging and shifting attention are the main priorities for the education of CWA (Landry and Bryson, 2004). Experts have noted numerous behavior problems displayed through inattention. These behaviors can be groups into four factors: inattention in doing tasks, inability to sustain attention in tasks, inattention in social interaction, and inattention towards people and objects. Example behaviors of inattention in tasks are: difficulty in following directions, difficulty in getting started on tasks, difficulty in maintaining place when reading, reliance on guidance in attending to task when working independently, not paying attention to details thus making many errors due to carelessness, slow and minimal written output and production, and procrastination. Example behaviors of the inability to sustain attention are: daydreaming, difficulty in keeping on task thus needing direct assistance, refocusing attention towards distracters, difficulty in focusing on what is being read, difficulty in organizing or remembering sequences, being easily distracted extraneous stimuli, failing to finish work resulting in many incomplete assignments, forgetting to bring or use important materials, forgetting to return things, and underestimating the length of time the completion of a task will require (Corley, 2006; Rief, 2003; McEwan, 1998; McCarney, 1995a and 1995b). Hogan (2006) recommends that managing behavior must be included when adapting material for and developing social skills of CWA. Only when special education practitioners continually learn to understand their students’ behaviors and learning styles can appropriate intervention on behavior management and teaching strategies be implemented. The Adaptive Behavior Scale for Infants and Early Childhood (ABSI) is used as an aid in preschool placement and program planning for children with special needs. Parents, teacher or guardians gather information from each developmental area to determine the child’s general maturation, learning and social adjustment. The scale includes attention as one of the major areas for development among the children. McCarney (1995a and 1995b) developed the Behavior Dimensions Scale to assess the behavior of children in the home and school settings. Among other behaviors, the scale addressed specific categories in inattention and impulsivity. The scale was based from DSM-IV. The scale can be used to determine symptoms of inattention, hyperactivity, impulsivity, oppositional defiance, conduct disorder, avoidant personality, generalized anxiety, and depressive episodes. The Vanderbilt ADHD Diagnostic Scale is used by teachers and parents to evaluate the behaviors of the child in five areas which are: inattention, hyperactivity/impulsivity, combinations of these, oppositional/defiant or conduct disorders, and anxiety or depression symptoms. Both parents and teachers rate the child’s observed behavior through a 4-point frequency scale. The items of the instrument were written in the educational context to best describe the child’s behavior in school (Wolraich, Feurer, Hannah, Pinnock and Baumgaertel, 1998). The ability to control attention is a requirement for success in the classroom. Inattention interferes with the child’s success in the classroom because of their tendencies to focus on inappropriate stimuli. The child can also be easily distracted when paying attention to the proper stimuli. Two kinds of inattention must be addressed. The first is external distraction when the child cannot be seated near the classroom door because the noise in the hall is distracting. The second is internal distraction when the child becomes preoccupied with doodling or daydreaming rather than attending to the class activity. These two forms of distraction lead to impediments in learning. Earlier and more effective attention building programs can help in children’s academic success (Coleman, 1996). Attending skills are utilized through concentration. When the focus of attention is on a specific subject, other subjects are pushed into the background. Attending behavior occurs when cognitive processing of connections in the brain take certain paths while others are temporarily excluded. Increasing the frequency of tasks requiring attention develops one’s neural connections. Tasks done in a positive mood will teach children that concentration is feasible. Children increase their frequency and capacity to attend when they are motivated. If the lack of attending skills hinders social and intellectual development thus affecting school performance, interventions on behavior management can help the child learn to postpone and persevere in activities leading to success in school (Wall, 2004). Inattention is the most important observable hindrance to the child’s learning. When the child has overcome inattention and has learned to attend, shared attention can be introduced so that the child will be aware of the teacher’s presence. The capacity to attend and learn through shared attention is important to prepare the child for schooling. Children with inattention problems typically move from object to object, wander aimlessly, become flighty or over focused (Greenspan and Weider, 1993). School readiness can be applied in the world and life of CWA through structured and planned lessons. Independence in learning functional life skills can be developed among CWA through instructional means that meet behavioral expectations (Porco and Dalrymple, 1989a and 1989b). Numerous studies on attention have been done internationally. Many of these studies focus on the identification of attention problems. A study by Silverman and Gaines (1996) aimed to measure the attention span and persistence of toddlers through direct observation. The researchers gave 38 children three problem solving tasks to measure their persistence while videotaping their performance for later observation. The results indicated that there is no interrelation between persistence and attention span. A document study reviewed the factors contributing to sustained attention among children with ADHD. The study aimed to support the theory that inattention is associated with school failure among children. Since the study involved a review of previous studies, there were no respondents; the study only reviewed medical, behavioral and instructional interventions for people with problems in attention. The study identified that increasing antecedent stimulus conditions through tasks and settings can normalize and increase attention leading to improved school performance (Zentall, 2005). A study by Rescorla (2005) described children’s emotional behavioral problems on attention. This study used the Aschenbach System of Empirically Based Assessment (ASEBA) in comparison to two other assessment methods. The study subcategorized results of assessment from CWA and determined that the common behaviors on inattention were concentration, sitting still, clumsiness, inability to wait, quick shifting of attention and wandering. The study implied the need to address these attention problems using a fitting intervention. In another study, 48 adolescents and young adults with autism were assessed twice: during their preschool age and then during their middle school age. The study aimed to determine the improvement of adolescents with autism since their first assessment in preschool. Results showed that those who were able to develop attending skills during their preschool years did well in language and cognition as they reached adolescence (Sigman and McGovern, 2005). Landry and Bryson (2004) studied the attending skills of 15 CWA, two of which were children with Asperger syndrome. The researchers introduced ten simultaneous and successive trials to measure disengagement and shifting of attention among the CWA. The performance of the CWA ere compared with a group of children with Down syndrome and also with a normal group. The results showed that CWA had difficulty in disengaging attention. Another research compared the selection of attention between 19 CWA and 19 children from a typical group. This study determined the selection for attention using two experiments, one focusing on semantic information and another on attention direction. The results showed that the CWA had difficulty in shifting and disengaging attention (Fletcher-Watson, Leekam, Turner and Moxon, 2006). A practical intervention in training attention among children, which included CWA, was created by Creamer (2005). The program, called Play Attention, was aimed to help children with problems in focusing. Play Attention is a computerized feedback-based program enabling individuals to control a computer screen character using a sensory helmet. If attention is lost because of fidgeting, distractions or off-task behaviors, the characters go the wrong direction. Play attention is a combination of feedback and behavior modification used to improve the attention and decrease impulsive behavior. When children realized the connection between their behavior and attention, it enabled them to understand the concept of attending. The study proved that effective intervention programs required visual stimulation and physical action and reaction. Play Attention has helped many CWA in an after-school tutoring program or during school hours. The study confirmed the presence of ADHD symptoms of inattention and impulsivity among CWA. This portion of the review of related studies and literature will discuss impulsivity based on its definition, specific behaviors and implications in the school setting. Related studies will also be reviewed and considered as theoretical bases for this research. Impulse control is the capacity to think before acting, and to delay or inhibit responses based on a personal evaluation of multiple factors. Impulsivity is also regarded as the lack of self-regulation or self-control. Impulsivity is the inability to process stimuli, plan and predict how the corresponding behavior affects others. Self-regulation of behavior is a sign of good executive skills which comes from the active participation of the child following a successful intervention. To override immediate demands in favor of longer-term goals, the children require the ability to inhibit impulses and goal perseverance through effective behavior regulation. Certain interventions which involve planning, metacognition and self-regulation decrease impulsivity (Dawson and Guare, 2004). Dawson and Guare (2004) explained behavioral inhibition using three properties. The first property is the ability to delay or prevent response that leads to an immediate consequence that may impact behavior. The second property is the ability to stop ongoing behaviors which are unsuccessful. And the third property is the ability to manage distractions or interruptions that might interfere with the work of other executive skills. Impulse control through the management of emotions and monitoring of thoughts leads to regulated behavior. When children are able to regulate their own behaviors, the can perform related skills such as planning and goal directed persistence effectively. The DSM-IV mentions specific behaviors of impulsivity which stem from the tendency to act without thinking. These are blurting out answers before the question has been completed, having difficulty with turn-taking and interrupting others. Impulse control is an important element for development at school and at home. The ability to control one’s impulses has implications on task completion and social relations. Children who experience difficulty in regulation and inhibition tend to say or do things without thinking which often leads to trouble with parents, teachers or peers. There is a growing need to address the self-regulation priorities of children in the school setting (American Psychiatric Association, 2000). Self-regulation includes the skill to alter perceived stressors through planning and problem solving and the regulation of negative emotions. Students who are impulse have lower task performance than those who have impulse control (Snow, Jackson and Corno, 1996). Wall (2004) recommended the use of shaping to decrease impulsive behaviors. Her research indicated that impulsive behaviors result from a combination of three elements: being overwhelmed by an oncoming stimulus, being unable to plan for the best moment to satisfy the need, and being unable to understand what the satisfaction of the need means to others. These three elements result in the inability to postpone the satisfaction of a need. Experts have listed numerous behavior problems on impulse control. These behaviors were grouped into two factors: blurting out responses and difficulty in waiting for one’s turn. Specific behaviors of blurting out responses are: blurting out responses verbally, difficulty in inhibiting what should not be said which leads to making tactless comments, saying whatever comes to mind, talking back to authority figures, difficulty in waiting for directions or listening to the full direction before acting, inability to take the time to read written directions before acting, interruption or intrusion on others such as tugging parents’ clothes or arms when they are talking to someone else, and hitting when upset. Specific behaviors in the inability to wait for one’s turn are: difficulty in following rules in class or games, grabbing things, high risk or fearless actions, difficulty in waiting for turn in games and activities, difficulty in waiting or delaying gratification, difficulty in waiting to be called or the inability to raise one’s hand to signal the desire to be called, displaying expressions or actions of impatience, inability to wait in lines, hurrying through tasks to get it finished resulting to numerous careless errors, difficulty in keeping hands and/or feet to oneself and breaking things (Cowley, 2006; Rief, 2003; McEwan, 1998; McCarney, 1995a and 1995b). It is during the early childhood stage when independence, self-control, and self-care increase in children. The early development of goal persistence and regulated attention also contribute to the development of good temperament among children. Teaching planning and learning how to plan for children who exhibit impulsive behaviors can be an effective solution. Teachers need to come up with innovative and effective ways to train impulse regulation of children. Impulsive behaviors are determined by the temperament of children (Papalia and Olds, 1995). Numerous studies on impulse control among CWA have been done internationally, many of these studies focus on the identification of behaviors instead of developing programs and activities to address impulsivity. In 1977, Rowe and Plomin studied descriptions of behaviors from 91 mothers of twins. According to their study, factors related to temperament also involved attention span-persistence and impulsivity. Specific descriptions of attention and impulse control were: “Plays with a single toy for long periods of time,” “Persists at a task until successful,” “Child goes from toy to toy quickly,” and “Child gives up easily”. The researchers were able to distinguish temperament differences between twins through these behavioral terms. A research on impulse control used a candy reward test to determine success in schooling among 4-year old children who were asked whether they would like to have one candy now or two candies later. The study concluded that children who were able to delay the desire for the candy were more successful in schooling (Delfos, 2004). A study was done on 19 children with Smith-Magenis Syndrome, a subtype of autism. Researchers used the Vineland Adaptive Behavior Scale and a childhood autism rating scale to evaluate the behaviors of the participants. Parents or primary caregivers were requested to use the instruments to evaluate the maladaptive behavior among their participating children. Among the children whose ages ranged from two to 12 years old, girls were found to be more impulsive than boys. Results indicated that impulsivity has a higher score than anxiety and conduct problems (Martin, Wolters and Smith, 2006). Gomez and Baird (2005) studied the self-regulation of 65 CWA. The researchers used the Temperament and Atypical Behavior Scale (TABS) to note self-regulatory behaviors of the participants through observation. The TABS observation scale was validated using split-half coefficients with the use of means and standard deviations. Some items on self-regulation measured inattention such as “Seems to look through or past people,” “Acts like others are not there,” “Seems to be in his own world’”, “Tunes out—loses contact with what is going on,” “Shows no surprise to new events,” and “Doesn’t react to his own name”. The researchers confirmed that CWA also exhibit self-regulator deficits and can be easily distracted. A study was done on 78 kindergarteners and 79 first graders. The researchers used the Behavior Checklist Scale to identify problem behaviors which can be risk factors among children. Researchers identified that specific externalizing behaviors were based on impulsivity. These impulsive behaviors were temper outbursts, stubborn behavior, destruction of toys and aggression. The study determined that temperament contributed to emotional and behavior problem among children. The researchers recommended that more activities to increase temperament be given as intervention in order to teach positive behaviors (Nelson, Stage, Duppong-Hurley, Synhorst and Epstein, 2007). With impulsivity and inattention causing disruptive behaviors in the classroom, Gresham, Lane and Beebe-Frankenberger (2005) studied the predictors of hyperactivity, impulsivity, inattention and conduct problems. 165 students in grade three from 32 schools in southern California became participants in a five-year longitudinal study to examine their academic, social and affective characteristics in relation to school failure and special education placement since grade three. Results were divided across three domains: academic, social and behavioral. The researchers indicated that the group with hyperactivity, impulsivity and inattention had a higher academic achievement compared to the groups with hyperactivity, impulsivity, inattention plus conduct problems and a separate group with conduct problems alone. As evident in many studies, behaviors on inattention and impulsivity have been identified among CWA. Experts declared that attention and impulse control are important pre-learning skills necessary to be developed among CWA. There has been a rarity in actual research on determining effective activities and programs to develop these pre-learning skills. This study aims to help CWA increase their levels of attending and impulse control through an activity that will be enjoyable and educational to children. The recommended activity is origami. This portion of the review of related literature and studies will discuss the definition, history, educational implications and studies on origami. Origami (折り紙) is the combination of two Japanese words: “oru” (折る) and “kami” (紙). “Oru” means “to fold” and “gami” is taken from thw rod “kami” which means “paper.” Based from the combined words, the material for origami is paper and the main technique is folding. By making a series of folds in a sheet of paper, people can create a wide variety of shapes, animals, insects and abstract forms (De Marcillac and GLMR and Liaison Agency, 2006; Wu, 2006). Originating in China during the first or second century, origami spread to Japan during the sixth century. Origami apparently began in 1600. From 1688 to 1704, origami sculptures such as the crane and several varieties of boats became popular. Origami became widespread in 1868, mass produced and low-priced paper became available. Instructions to make sculptures were published in books and presented to the public through exhibits (Masao, 1999). Numerous instructional books on origami were published beginning in the 1700s. In 1794, an instructional book on origami written by Senbazuru Orikata showed how to fold a whole series of linked cranes. In the same year, Orikata printed instructions showing how to fold a series of human figures for a theatrical play. In 1845, the book “Window of Midwinter” featured a collection of around 150 origami models. Sometime in 1850, a private handwritten collection of information called the “Kayagarusa” was composed of two volumes of origami instruction. The instructions on folding used a style similar to Orikata’s. In 1958, Kosho Uchiyama, a Buddhist monk, published an origami book for children called “Origami Zukan.” Akira Yoshizawa published the book, “Origami Tokuhon” in 1957. Kosho Uchiyama and his father Michio Uchiyama created more sculptures and published more books on origami for adults and children. The publication of origami books led to its increase in popularity in Japan. The popularity led to the functional use of origami among children who made origami for toys and play (Andersen, 2004a). In the eight century, the Moors brought paper folding to Spain. The initial forms of paper folding were geometric figures. As trade routes developed, paper folding spread to Europe and later to the United States. The English playwright John Webster referred to the ‘paper prisons’ in which small boys capture flies to increase the loudness of the buzzing. These ‘paper prisons’ were actually the water bomb paper balloon which became a well-known toy in China, Egypt and England in 1614. In 1757 a boy from Guillermo Pen of Spain gave his friends paper sculptures shaped like kites, boats, ships, birds and many other things. An innovation on paper sculptures was the “blintzed” base which was popularized by the American, George Rhoades. The exhibit of Akira Yoshizawa at the Stadtlich Museum in Amsterdam was a noted even in 1955. The famous Spanish philosopher, Miguel Unamuno, the Rector of Salamanca University, wrote about the Spanish paper bird known as the pajarita. He later discovered more folds for it. In 1940, Unamuno’s paper folding was taken to Argentina where Dr. Solorzano Sagerdo further developed and published books about paper folding. In North America magic trick books, such as “Paper Magic” written by Will Blithe, were published in 1920. In 1922, Harry Houdini published the book with the same title, “Paper Magic,” also containing instructions to paper folded figures. In 1928, more specialist books on paper folding such as “Fun with Paper Folding” by W.D. Murray and F.J. Rigney were published in the United States. In London, “Paper Toy Making” written by Margaret Campbell was published in 1937 (ThinkQuest Junior, 1999; Andersen, 2004b). An origami book by Satoshi Takagi was published by the Nippon Origami Association in 1993. It contains origami illustrations of boats, boxes, hats, cranes, and many others. These are paper sculptures similar to what is known today in both Japan and in the West in 1960. The book “Sadako and One Thousand Cranes” was published by Eleanor Coerr. This book started a movement when the International Peace Project used paper-folded cranes to promote peace and tolerance. The international Peace Project encouraged people to create a million paper cranes to promote world peace by year 2000. When a thousand cranes are folded, the supporters of the project believe that their wish for world peace will be granted. The International Peace Project aims to have the wish of peace granted in the 21st century (Levenson, 2005; Andersen, 2004a; ThinkQuest Junior, 1999). Nature as a Theme in the History of American Literature. Richard Wright’s "Uncle Tom’s Children"
Lawrence, Louise - Children of the dust - Der Jugendroman - Geeignete Literatur für den gymnasialen Englischunterricht?